FINDING NEMO Sea of Activities Jumper is rated 4.4 out of 5 by 42. Just keep jumping with the Finding Nemo Sea of Activities Jumper! This magical entertainer from Disney Baby will take your baby on an underwater adventure all the way to P. Sherman 42 Wallaby Way Sydney. Surrounded by a sea of Nemo-themed toys, you’ll watch waves of wonder upon her face as she interacts with the 13+ activities created by Bright Starts. She’ll clown around with her favorite clown fish, sea herself in a baby-safe mirror and play with all her Nemo favorites, like Dory, Bruce, Mr. Ray and more. Baby can steer her ship anyway she wants in her 360-degree rotating chair, made with a high-backed seat for extra comfort. 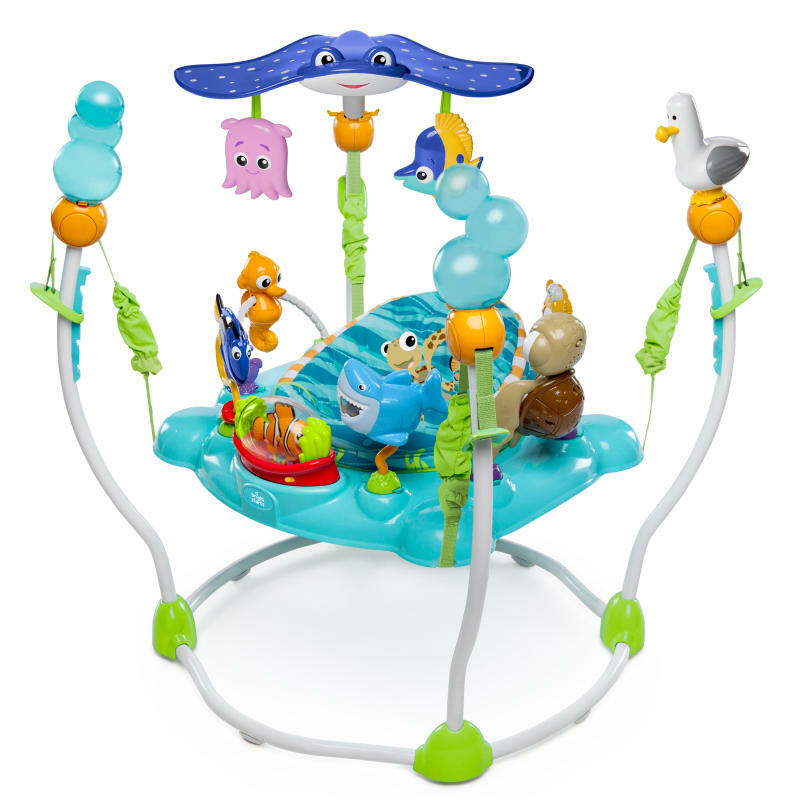 With dancing lights, sweet songs and Finding Nemo friends, your baby will love to dive into playtime! Dimension (in) 30.5" x 34.1" x 24.5"
Rated 4 out of 5 by tina from bubble parts i need to know where to buy replacement parts for the bubbles that sit on the top it snapped off when installing since it was a gift i cant exchange it. is there a way to buy the bubble part. Rated 4 out of 5 by Nana banana from Love Finding Nemo theme I just got this toy to use for my grandbabies. Mr. Ray is not staying locked into his spot - he leans down an inch or so. Is there a way of getting replacement parts? I'm not sure if Mr. Ray is the problem or the orange peice he clips into. Any info on who to contact about this problem, would be appreciated. Rated 2 out of 5 by Megziggy from Disappointed This is a rather expensive jumper so I’m not impressed that my son was actually able snap the big turtle toy off. He is only 9 months old. Rated 2 out of 5 by Megziggy from Disappointed This is a rather expensive jumper so I'm not impressed that my son was actually able snap the big turtle toy off. He is only 9 months old. Rated 5 out of 5 by Hooknbabs from oldest daughters favorite movie, fun to have a toy "reinact"
Rated 5 out of 5 by Hooknbabs from oldest daughters favorite oldest daughters favorite movie, fun to have a toy "reinact"
Rated 4 out of 5 by Deb23 from Great, but... My granddaughter loves this. But she is pulling up on the manta Ray. Can you buy replacement parts? I'd like to replace it with another seagulls or bubble. Rated 5 out of 5 by Sofi from Great Nemo inspired Jumper Love Nemo & of course fell in love with this design. Many activities to keep baby entertained and interacting. Only wish it was a little wider- it seems everything is right on babies face. Other than that we both love it.